In a passionate defense of affordable healthcare, Vermont Senator Bernie Sanders used a giant cardboard cut-out of a Donald Trump tweet to remind the president-elect of his promise not to cut Medicare and Medicaid. Discussion on the future of the Affordable Care Act, also known as Obamacare, and Medicare and Medicaid is raging in the US. The Republican Party plans to reform Medicare, Medicaid, and social security and completely jettison Obamacare, arguing the programs are unsustainable and face being insolvent within 20 years. A debate between senators on the resolution to repeal the Affordable Care Act took place on Wednesday. The law, which extends health insurance and makes it compulsory for some businesses to provide the social safeguard, has been widely opposed by Republicans since it came into practice in 2010. Days before the presidential inauguration, Senator Sanders issued a reminder to president-elect Donald Trump of where he stood on the health care matter while campaigning. Perhaps frustratingly for Sanders, many corners of the internet appear more interested in photoshopping his political statement for laughs. 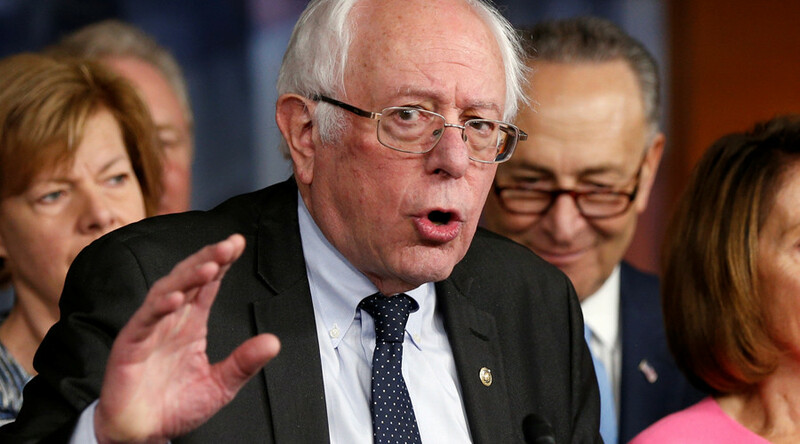 Sanders told the Senate that instead of arguing the repeal of the Affordable Care Act, US citizens would be better served if its politicians worked on a way to actually guarantee a “cost effective” system. “But that is not what we are debating today,” he said. “The Republican budget plan lays the groundwork for ending the Affordable Care Act. “Now there is nothing wrong with change… [but] I would hope my Republican friends who want to repeal the act will come down and tell us what their plan is. How in fact are they going to provide quality, cost effective healthcare to all Americans?" Earlier, the one-time Democratic presidential candidate described the Republican budget proposal – which hits out at the Obama administration’s “skyrocketing healthcare costs” – as one which would deny health insurance cover to millions of people. “What we are looking at now is a budget process whose ultimate goal is to remove health insurance from tens of millions of Americans. Let us be clear, we are the only major country on earth that does not guarantee health care to all people as a right,” Sanders said. “Repealing Obamacare will lift a substantial financial burden on businesses so they can channel their resources toward hiring more workers and growing the economy,” it says. In a series of tweets on Thursday, Trump said it is time for Republicans and Democrats to get together to “come up with a healthcare plan that really works”.